Complimentary Classic Primer(7ml) & Primer Water(5ml) on orders worth Rs. 1900 & above. Offer valid till stocks last. This liquid shimmer potion acts as a weightless sparkle topper for lips and a shimmering liquid highlighter for face. Vlada calls it “drops of heaven!” It instantly adds light-capturing luminosity and glitz to any look. Try it over your favorite Always On Matte Liquid Lipstick or anywhere you want a pop of radiance. 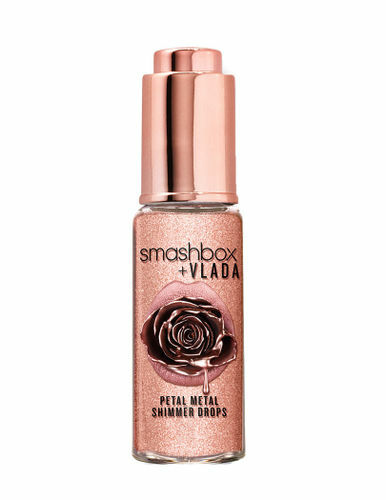 About Smashbox x Vlada Petal Metal Metal Collection:Get dipped in rose gold with the limited-edition Petal Metal Collection! It was co-created with makeup artist and Instagram star Vlada Haggerty (@vladamua), who’s also Smashbox’s lip editor-in-chief. She loves creative collaboration and used her signature rose gold color as the inspiration for these statement-makers for face, eyes, lips and body. What else you need to know: The product is free of parabens, phthalates, and fragrance. This product is also vegan and cruelty-free. Explore the entire range of Highlighters available on Nykaa. Shop more Smashbox products here.You can browse through the complete world of Smashbox Highlighters .Alternatively, you can also find many more products from the Smashbox Petal Metal Shimmer Drops range.